Apple has made significant changes to Safari in Mac OS X 10.5 Leopard, introducing integration with Dashboard, smart drag and drop of tabbed windows, full text searching of your web history, and more. Here's a look at the birth and maturity of the online web browser, as well as a look at what's new in Safari 3.0. This report goes to great lengths to explore the origins, history, and maturity of the web browser. For those readers with limited time or who are only interested in what's due in Leopard, you can skip to page 3 of this report. The World Wide Web itself got started on NeXTSTEP, but the ideas behind delivering hyperlinked documents with scripted behavior went mainstream several years before the development of the web as an Internet service in 1990. 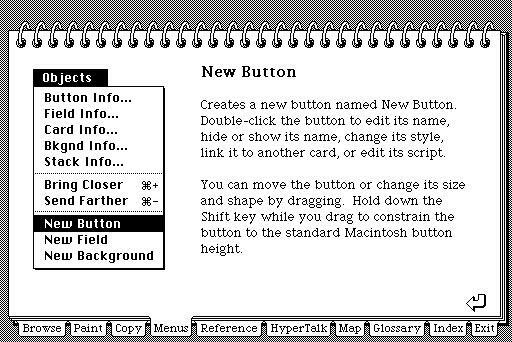 The first mainstream application for developing and using hyperlinked text and media was Apple's 1987 HyperCard for the Macintosh (above). The system worked like the forms designer of a graphical database or a rapid application development system. Standalone collections of hyperlinked cards called Stacks were powered by HyperTalk, a scripting language designed to be approachable by non-technical users. Bill Atkinson, who had worked on HyperCard at Apple since 1985, assigned the rights to the application to Apple under the condition that the company would bundle it for free on all new Macs. 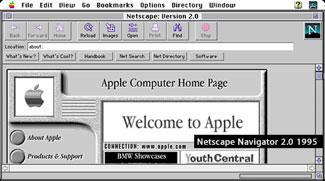 That ended up making HyperCard popular with Mac users but didn't do anything to impress Apple executives, who ended up marginalizing its continued development until it eventually fell into obsolescence. HyperCard was spun off into the Claris software subsidiary. Plans to merge HyperCard into QuickTime as a scripted interactivity layer called QuickTime Interactive began in the mid 90s, but it was never completed. The remains of HyperCard as a product were eventually abandoned, along with QTi, during Steve Jobs' housecleaning purge that followed Apple's acquisition of NeXT in 1996. NeXT's 1988 Interface Builder for graphical, rapid application development. Microsoft's 1991 Visual Basic development environment. 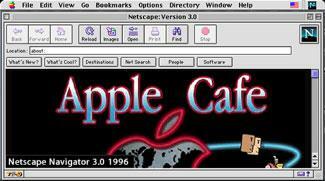 The world's first web browser, called WorldWideWeb, appeared in 1990. Developed by Tim Berners-Lee at CERN using NeXTSTEP (above), it served as the client software for a new www Internet service, which defined HTTP, the HyperText Transmission Protocol, as a way to deliver linked hypertext documents from www servers hosting pages to the www browsers requesting them by URL address. Steve Jobs' NeXT computer was central to the development of the the web largely because it offered uniquely advanced rapid development tools, but also because NeXT occupied a niche in higher education and advanced computing, and provided full support for the open Internet at a time when PCs were just beginning to use local area networks. 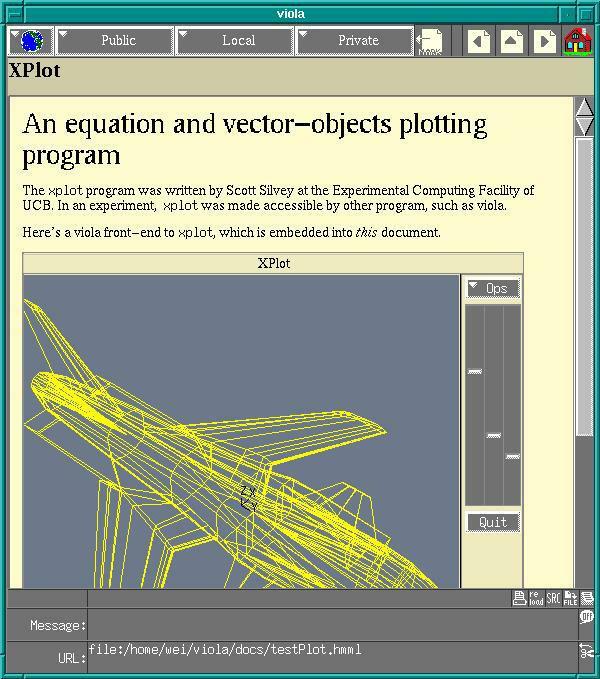 At the same time, Pei-Yuan Wei at UC Berkeley began work on Viola, a project to bring the features of HyperCard to Unix terminals running X Window. "I got a HyperCard manual and looked at it and just basically took the concepts and implemented them in [X Window for Unix]," Wei later explained. Wei intended to adapt Viola to use the Internet to distribute its hypermedia documents, but then happened upon the work already done by Berners-Lee on NeXT. 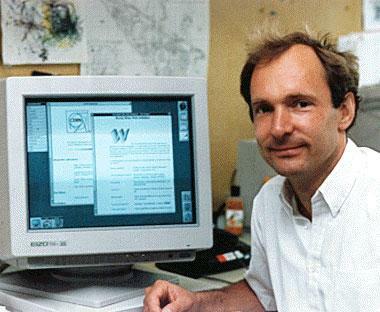 Adopting the HTTP architecture of Berners-Lee's www service resulted in the creation of the ViolaWWW web browser for X Window systems in 1992 (below). Authored and advocated by US Senator Al Gore, the High Performance Computing and Communication Act of 1991 funded the development of the National Center for Supercomputing Applications' High-Performance Computing and Communications Initiative, which included development of the Mosaic web browser (below). 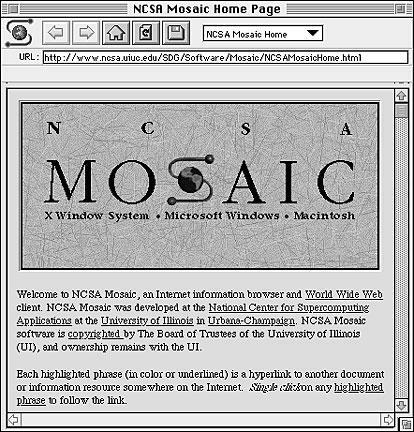 NCSA's Mosaic browser could be freely downloaded for non-commercial use and was rapidly made available to consumer operating systems, including the Amiga, the Mac, and Windows. While modeled after earlier browsers, including ViolaWWW, Mosaic's support for popular computing platforms, its ability to view graphics inline within web pages, and its focus on being easy to use for non-technical users all worked to rapidly make it the most popular web browser in the early 90s among the small population actually using the web. Marc Andreessen, who led the NCSA's Mosaic browser development as a student at the University of Illinois at Urbana-Champaign, graduated in 1993 and went on to found Mosaic Communications, later renamed Netscape, with the goal of delivering the commercial Netscape Navigator web browser. Andreessen partnered with Jim Clark, who a decade earlier had graduated from Stanford University in California to start up Silicon Graphics. Armed with his experience at SGI, Clark helped Andreessen develop a business plan for continuing the development of the Navigator browser. Since there were already other free browsers available, including Mosaic, Netscape decided to give away its web browser client and planned to make money selling web server software. 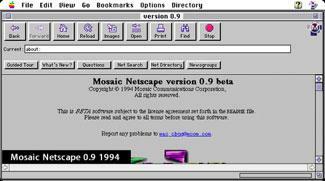 Netscape's initial rapid innovation and its adoption of Mosaic's policy of being free for non-commercial use quickly made its browser the new standard for web users. 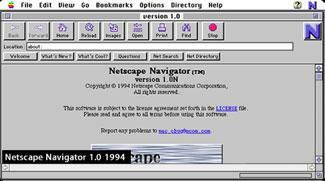 On page 2 of 3: Microsoft Discovers the Internet; Netscape Crashes; Apple's CyberDog; Netscape's Mozilla Burns to the Ground; Firefox Rises from the Ashes of Netscape; and Mozilla Pattered After Apache.